[prMac.com] Richmond, VA - FMWebschool, Inc., Announces FM Messenger Instant Messaging Software for FileMaker Pro FM Messenger Software. Now send messages, send photos, send files, PDF's, and web links all from within FileMaker. FM Messenger enables you to enjoy a full featured instant messaging experience all built with FileMaker Pro. Many companies do not allow their employees to connect to the internet, or allow third party chat applications. FM Messenger solves this problem. You never have to leave your desk to communicate with fellow employees. FM Messenger enables you to see everyone on your local network and communicate with them instantly. You no longer need to send emails with attachments. Sending messages and attachments is as easy as clicking on the recipient's avatar, selecting the file and pressing send. FM Messenger allows you to send messages to one individual or everyone on the network instantly. FM Messenger is extremely easy to set up. An entire office can be messaging and exchanging files in a matter of minutes. FM Messenger is an extremely powerful application with many advanced features. * Attach photos / image files and send them to a single person or everyone with the click of a button. * Have a website that you want to let everyone know about? Simply type the address, or cut and paste it into the text box - and send it. The text will automatically become a clickable link. * To see more features be sure to watch the demo movies at the official FM Messenger page. 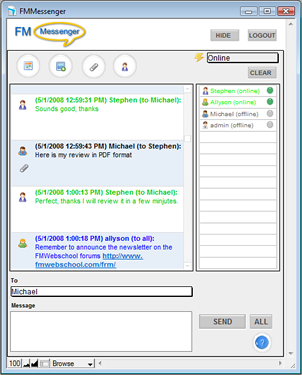 FM Messenger is a safe "non internet" way to connect your entire office and increase productivity.